ComplianceSigns.com customers say they would purchase from us again. For three years in a row, 99% of ComplianceSigns.com customers told us they would buy from us again. We've received many thousands of customer reviews to date, and every day our customers give us 5 stars and say they'll buy from us again. Shopper ApprovedRatingWhen you make a purchase from ComplianceSigns.com, you'll be asked to rate your satisfaction with our store, service and products. 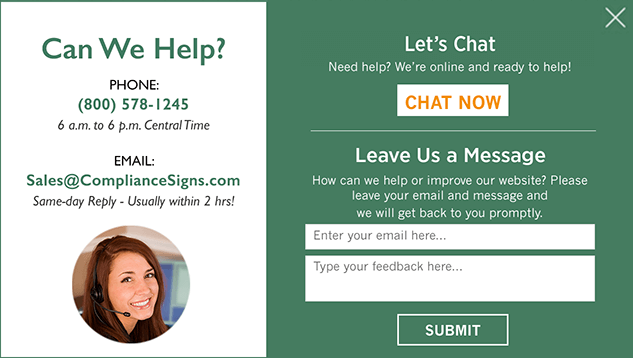 You can see our up-to-date satisfaction rating on our home page every time you visit ComplianceSigns.com, or check it out here. When you make a purchase from ComplianceSigns.com, you'll be asked to rate your satisfaction with our store, service and products. See our up-to-date satisfaction ratings with TrustPilot here. “I was extremely impressed with Polly Kelsey and assistance provided. Was very patient in working with me to come up with exactly our client wanted.” – Mike from J & R Supply, Inc.
“What I ordered online was exactly what we received. The quick delivery of our order.” – Jennifer G. from Corry Rubber Corp.
We're proud of all our great reviews, and we'll keep working hard every day to provide absolutely the best service, products and value. Your satisfaction is our top priority, and our experienced professionals aren't happy until you're happy. Our signs and labels are proudly Made in the USA at our plant in Chadwick, Illinois.